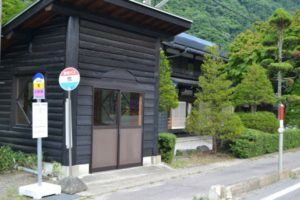 Time passes by very slowly at Miboro Ryokan with some crisp air, fresh natural water, beautiful scenery, and the village cuisine. 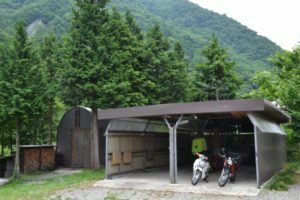 Parking space is available for a capacity of 20 cars / There are some spaces for bikes separately. 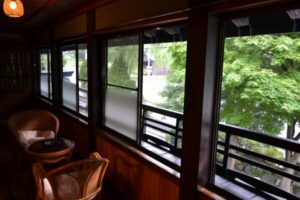 We are 2-story wooden building, approximately 80-year-old Japanese Style House. 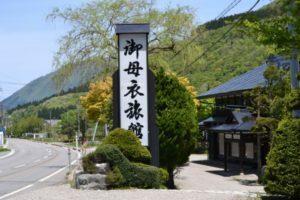 Along National Route 156, our big sign is the mark. We are located right under the Miboro Dam. 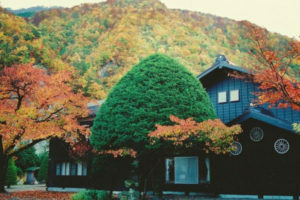 Visitors will be welcomed by colorful mountain scenery throughout the year. 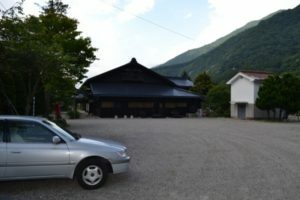 There is a plenty space for parking (a capacity of 20 cars). There are some spaces for parking bikes. There is a bus stop “Maki” is right in front of our building. Please visit us when everything is in white. 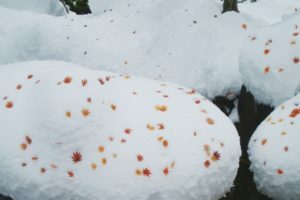 Sometimes, autumn leaves and snow can be seen together which is beautiful. 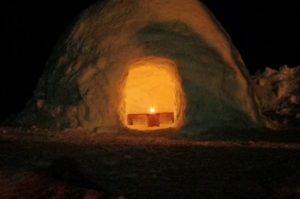 Huge ”Kamakura” (Japanese Igloo) will appear in the parking lot. Snow is cleared away everyday on the Route 156 when it snows. 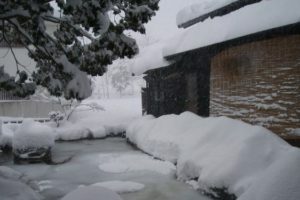 The pond in the courtyard is fully covered by snow in the late January. 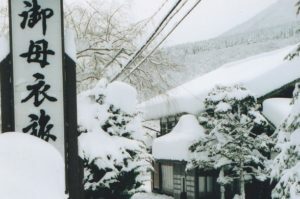 2-meter of snow on average expected in Shirakawa Village. Our building was used be a house of a lumber dealer. Welcome, this is our entrance. 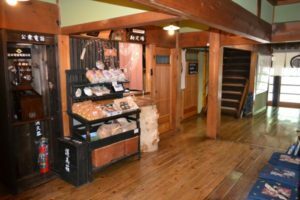 Our building is built with many old beams. 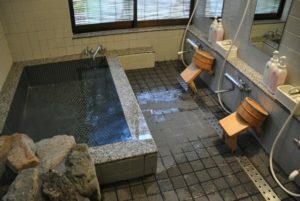 It is not hot spring, but we boil the natural water for the bath. Please feel free to relax with some tea in our cafeteria. 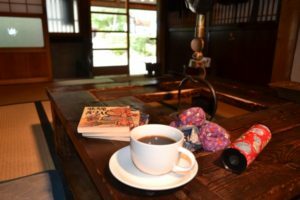 Coffee break by the hearth. Old fashioned pay phone in the hall. 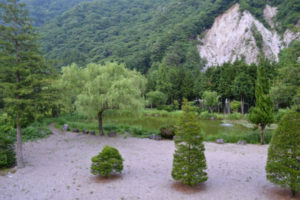 The view from MATSU Suite (“Matsu” = pine) with the bank of Miboro Dam. The view from KAME Suite (“kame” = turtle) with the beautiful maple trees. 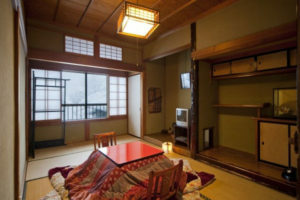 Kotatsu, a Japanese table with a built-in heater wii be equipped in the guest rooms during wither. 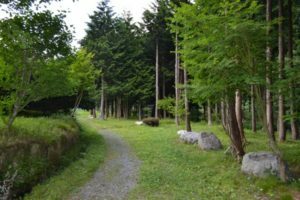 There is a pond and there are some paths in the Japanese cypress forest. 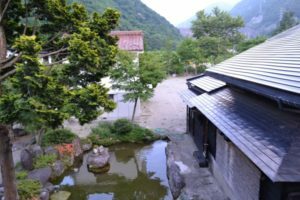 Shogawa River can be accessed from our backyard. 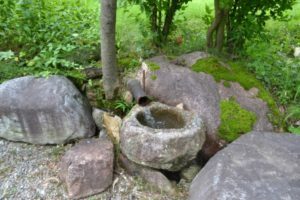 Natural, chilled water from the mountains. 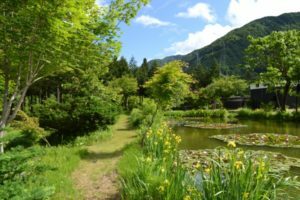 Yellow iris and water lily bloom in June. 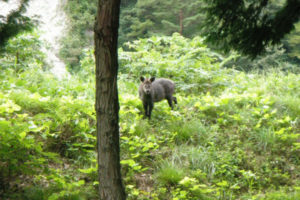 It feels cool and pleasant in the Japanese cypress forest even in summer. We hope you will enjoy the singing of birds in the morning, the sounds of insects in the evening, and the sky filled with beautiful stars during your stay. Please note for the followings. 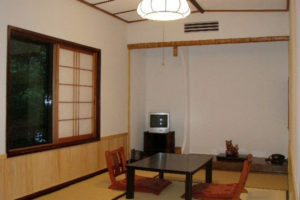 ・Restrooms, washrooms, and the bathrooms are shared. 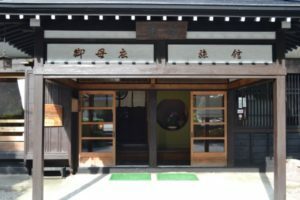 We have both Japanese and Western style restrooms. 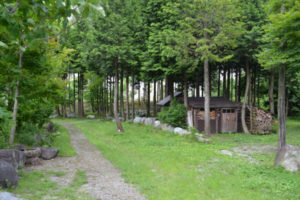 ・Two in one shampoo, body shampoo, soap, and blow dryer are equipped in the bathroom. 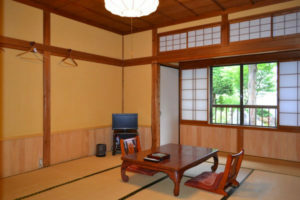 ・Each room has air conditioner. 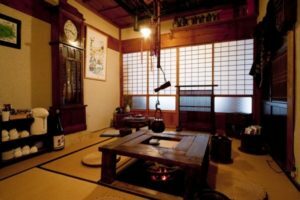 ※ Oil heater and kotatsu, Japanese table with a built-in heater will be provided during winter. 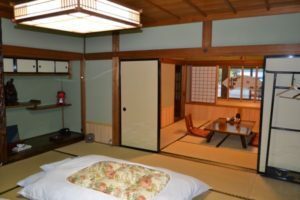 ・Safe, refrigerator, electric kettle are not provided in the guest room. Please ask our staff for anything needs to be refrigerated. 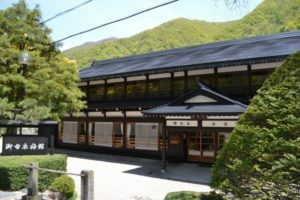 ・Due to our location being close to the mountains, insects could be found in our building. 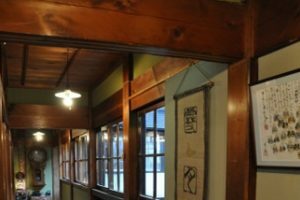 We appreciate your understanding for the sound insulation work has not been done throughly because of the building being very old Japanese style house. ・It starts snowing heavily from the end go December. 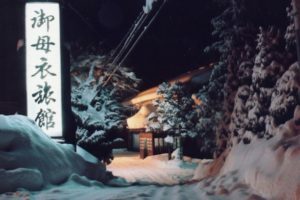 1 meter of snow could be expected. 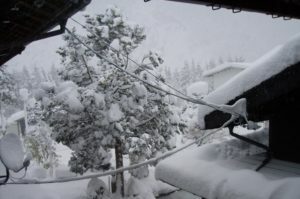 We highly recommend snow tires and chains for our guests who visit us by car.